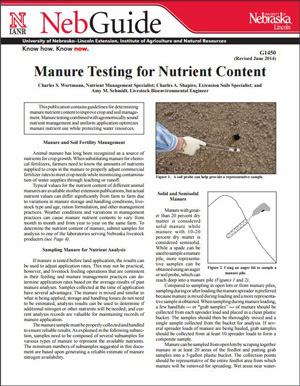 This publication contains guidelines for determining manure nutrient content to improve crop and soil management. Manure testing combined with agronomically sound nutrient management and uniform application optimizes manure nutrient use while protecting water resources. A list of Nebraska laboratories providing manure testing services and a link to a generic manure sample submission form are included.